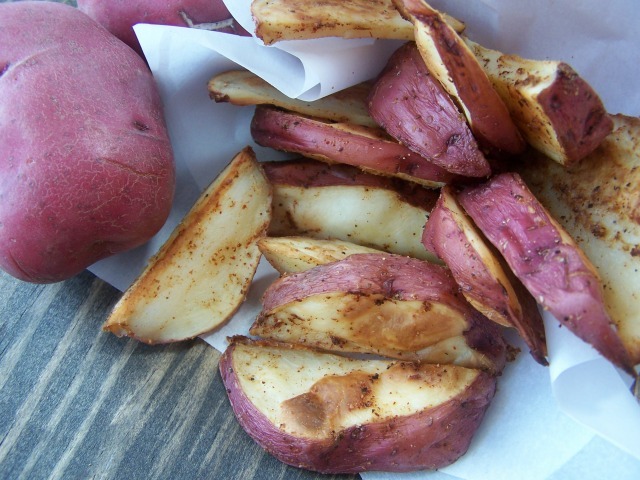 Since I know other people love potatoes as much as me...here's the recipe for Oven Baked (No Oil) Potato Wedges. 5+ red potatoes (medium size, but there were a few big ones in my bag). I have also made these with fingerlings. You just have to adjust your baking time. 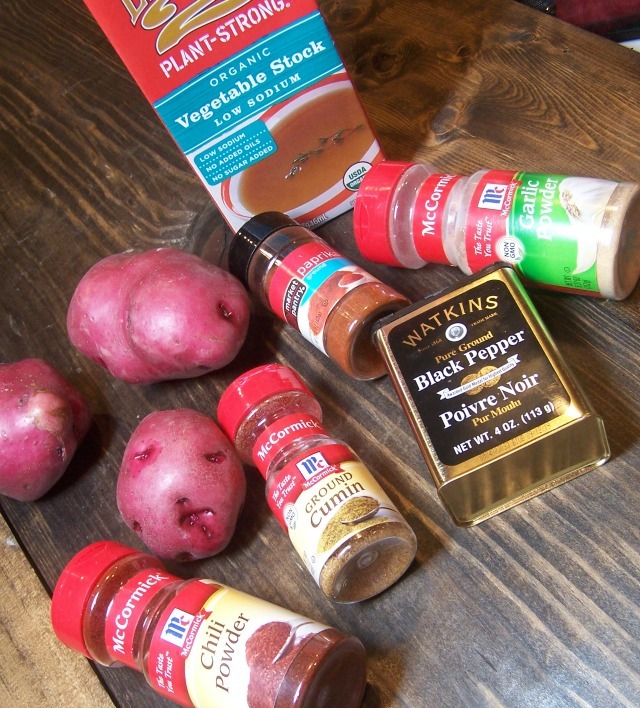 Spices: I used a spice combination similar to the one I use in my Baked Chili Brie. You can use your favorite spices or simply salt and pepper. Cut them into wedges (to be fair, mine do not all look like wedges, but I tried) and try to keep the thickness similar. I cut each potato in half lengthwise, laid it flat, cut it in half again lengthwise and then cut diagonally into the center to create my (mostly) wedges. You could also cut disks (just adjust the baking time). Sprinkle in your spices and toss to coat as much as possible. 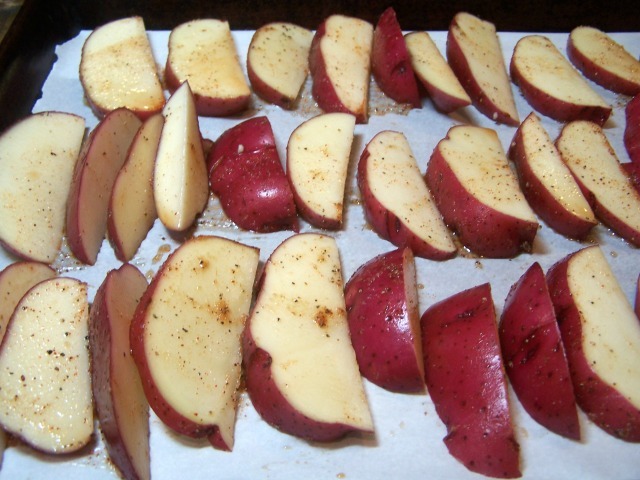 Lay the wedges in a single layer on the lined baking sheet. If there is extra liquid/spice mixture, go ahead and drizzle it over the potatoes. Bake for 30 minutes. Check and flip the wedges over. Bake for another 15 minutes. NOTE: if you are using thinner wedges (like when I used fingerlings or disks) check for doneness at 30 minutes and then check every 5 minutes. 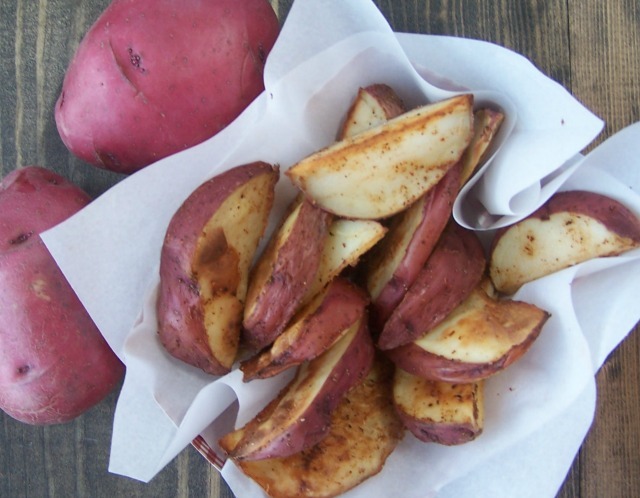 Serve warm and enjoy your healthy potatoes! Make them extra fun and portable by serving in my cute paper trays! What's your favorite potato dish? Wow! 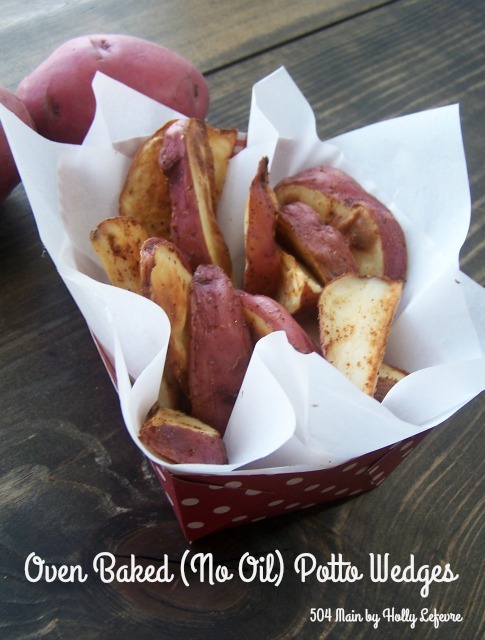 These potato wedges were a big hit in my house. Thank you for the great recipe!